The Man Bird and I had the chance to escape to the historic city of York recently, and having visited many years before, and loving it, we jumped at the chance to revisit this magnificent English city. I’m not always the sharpest tool in the box, I’ll freely admit, but I really did surpass my daftness on this occasion. A couple of days before we were due to visit, I realised that we had in fact stayed at The Mount Royale Hotel some 20 *ahem* years before! Then I also remembered the quite stupendous Kedgeree that I’d had for breakfast; this recalled memory had me drooling, so I was desperately hoping to repeat the experience. Friday traffic had been exceptionally good to us, and we pulled into the car park for York’s Mount Royale Hotel a little before 11am, having passed Dame Judi Dench’s old school (The Mount School) a few seconds previously! We were a little vexed as to where we would park having arrived so early, but the reception staff very kindly they said it wasn’t a problem; although we couldn’t check-in quite yet. From The Mount Royale Hotel it’s only a mile or so to walk into the city of York, so that’s what we did. 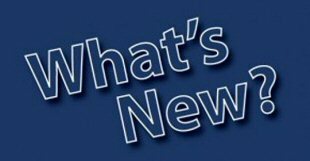 I shall tell you the start of our York adventure in a separate piece; I want to concentrate on the accommodation aspect in this blog. The Mount Royale Hotel began life as two 17th century private houses that were built in William IV’s reign, transforming into its present guise in 1967 when Richard and Christine Oxtoby took it over. Presently it is run by Stuart Oxtoby, and he and his staff strive to bring guests old and new the very best in service and facilities. This establishment is pet friendly, but they don’t allow animals to be left in bedrooms unattended. 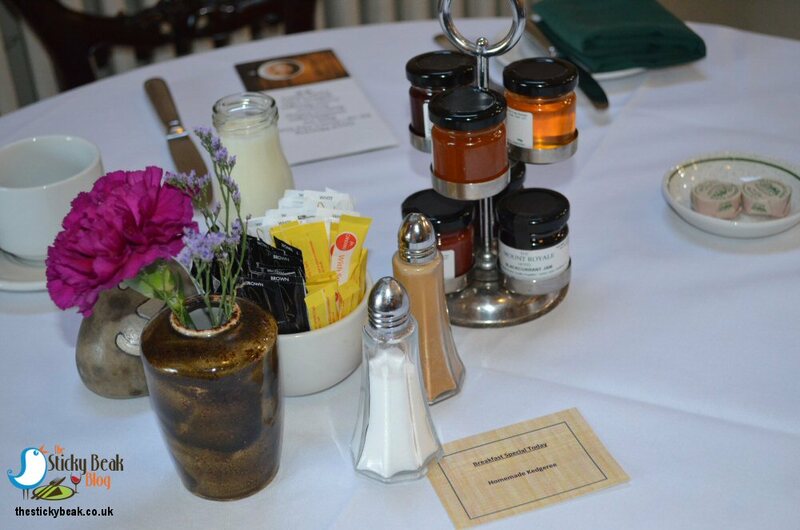 Room rates all include a full English breakfast, for which they have just received the AA Breakfast Award 2018. What struck me is the lack of a Hotel feel The Mount Royale has; it really does feel like a home the moment you go up its stone steps into reception, and the greeting we received only served to reinforce this impression. The lovely young lady made His Nibs and I feel like long-lost family, whose arrival was long anticipated. We checked in very swiftly and she guided us up to our room; and what a room it was! 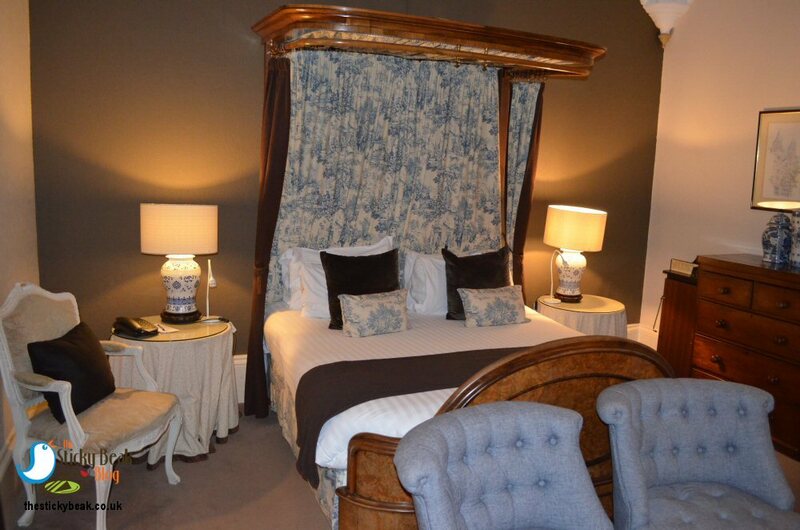 Room 20 simply took my breath away with its blue and white theme and the antique vases on the desk and drawers. The ice white linen bedecked, Toile de Jouy - canopied bed took centre stage, closely followed by the imposing freestanding Cheval mirror. The magnificent Walnut, free-standing wardrobe contained two sumptuous black robes, an iron and board, safe, fan, and hairdryer within its dimensions. 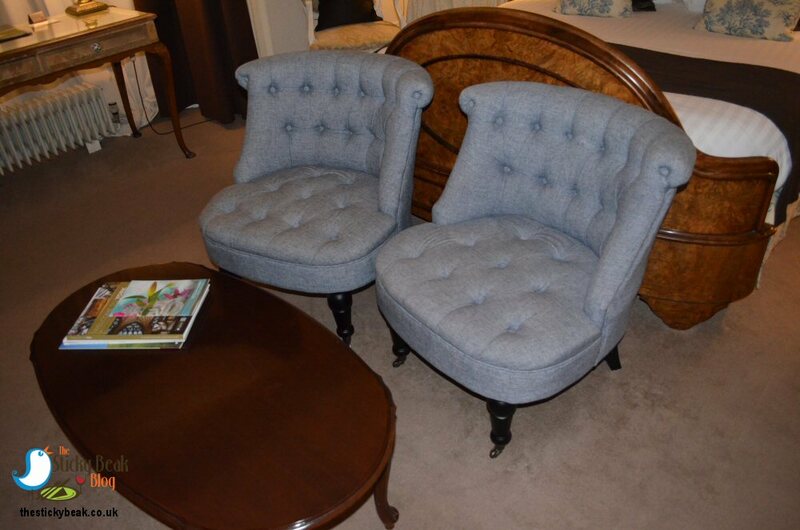 For those needing to work, there was a large writing desk and comfy chair in the room and a pair of large, pale blue armchairs sat at the end of the bed with a coffee table to place papers on, or you could watch the television from here too. 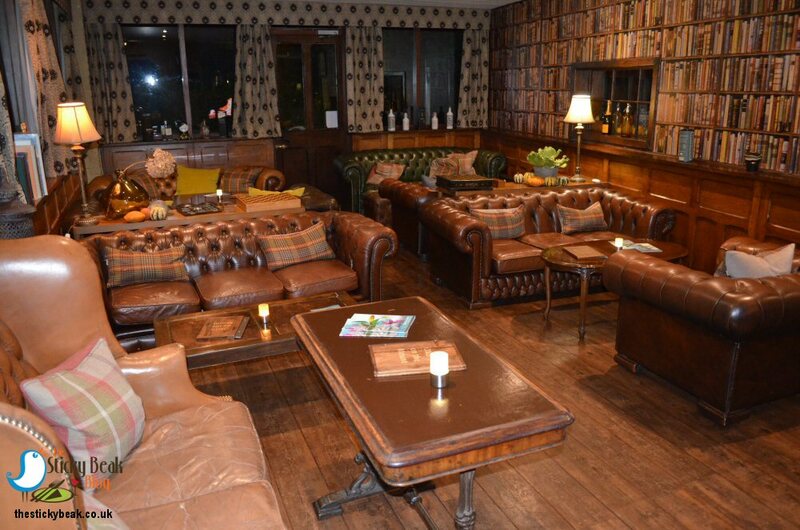 The Mount Royale Hotel does have a relaxing coffee lounge and a cosy bar, but if you simply want to enjoy refreshments in your room then there is an extensive selection to choose from. Coffee lovers can make their own Cafetiere with a coffee pouch ready to brew, or if time is the enemy, instant coffee sachets are available too. Tea freaks have fruit, herbal or regular black brews at their disposal, and we found our fridge contained 2 bottles each of still and sparkling mineral water too. As you know, we are a divided nest on many subjects, not least as to whether the Bath or Shower reign supreme in the bathing stakes; the bath is king, clearly! Luckily, marital harmony was not going to be unhinged on this occasion, the deep bath had a power shower with it and an ample screen at the side. The Man Bird is a sensitive-skinned soul believe it or not, so he always takes his toiletries with him; however, after trying out the Caroline Henry Blend #2 range in our bathroom he suffered no ill-effects. 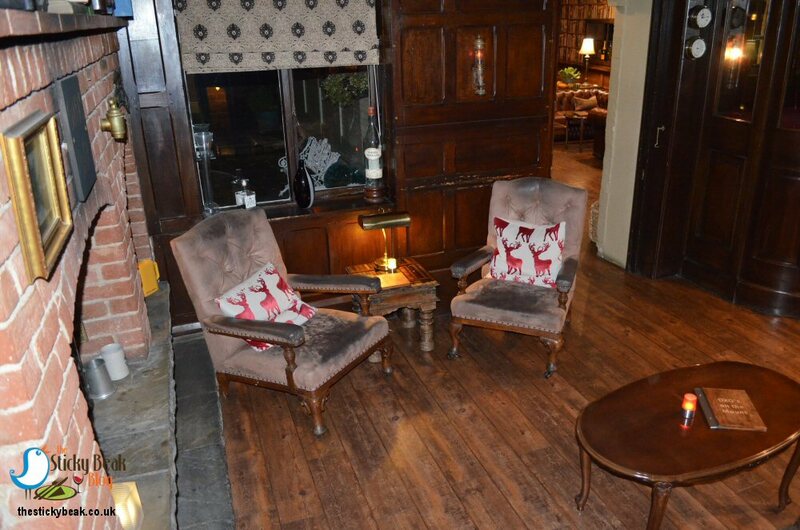 Clearly, good quality permeates every aspect of a stay at The Mount Royale Hotel in York. Back to my favourite feature - the bed; seriously, the one in room 20 just begs you to surrender yourself to its cloud-like body! As I lay upon it, I found myself gently being enveloped into its luxuriant depths, and after having flung ourselves into the first days’ activities, I could easily have relinquished my body eternally to this marvellous master of slumber. Needless to say, I slept like a babe that night. Each room at The Mount Royale is unique in its character, though all of them have that fabulous country house feel, and ours had a view over the mature gardens. Talking of the Old English Garden, this inner-city hotel rarity holds many secrets within its walls! 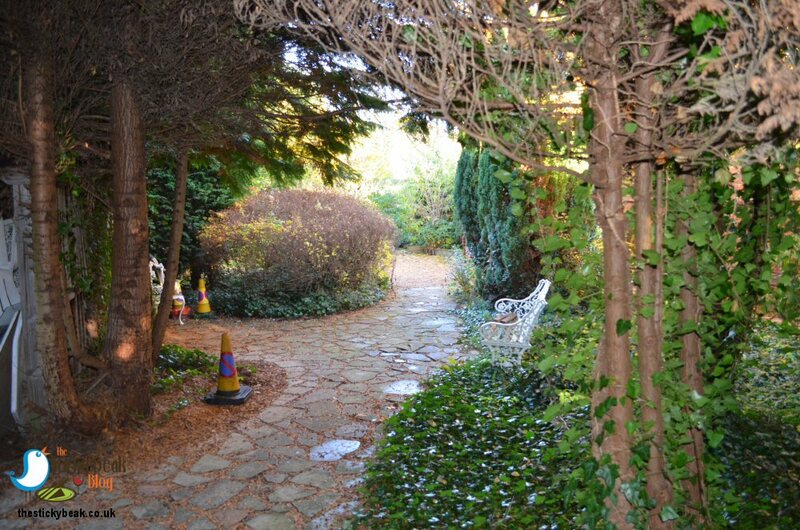 As The Man Bird and I strolled through them we discovered several items of horticultural paraphernalia from bygone years, and archways fashioned from the trees, bushes, and shrubs beckoned you go to through them and discover ornaments and flower beds filled with beauty. 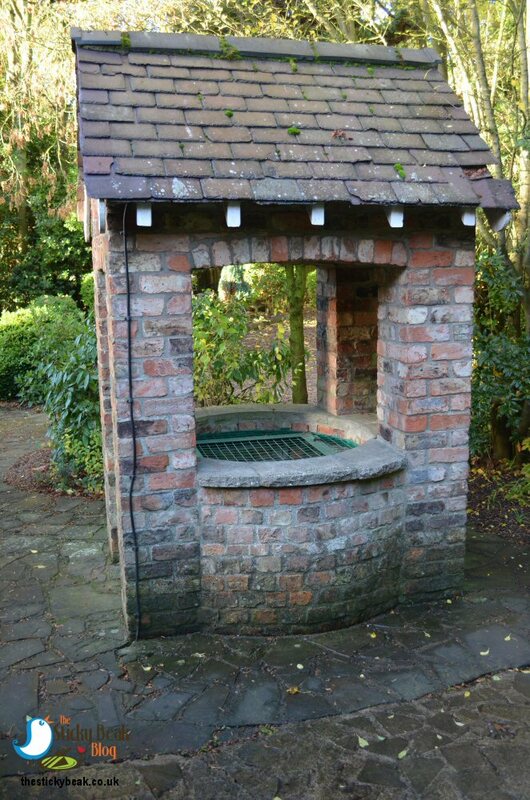 Within the gardens are some gorgeous Spa and relaxation facilities. The outdoor heated pool is open May-September so we missed this gem, but no need to fret because the Scandinavian log cabin with Sauna and Steam Room, and the outdoor heated Hot Tub are open year-round. Relaxation ahoy!! On the subject of Spa and Relaxation, the Mount Royale also has the 5 senses Spa suite that offers a range of treatments including facials and massages. Unfortunately we didn’t have time to indulge, but I did sneak a peek and saw that they use REN skincare – another quality brand! 5 senses spa is closed Sunday and Monday, but opens midweek from 9.30am-9pm, and on Saturdays from 9.30am-6pm. It’s a curious thing, but whenever I’ve had a particularly cracking nights’ kip I always wake up with an appetite like a bear coming out of hibernation! Honestly, I could chew my own knuckles, I’m that hungry! So I galloped my way down the stairs with obscene speed (Usain, move over dude!) 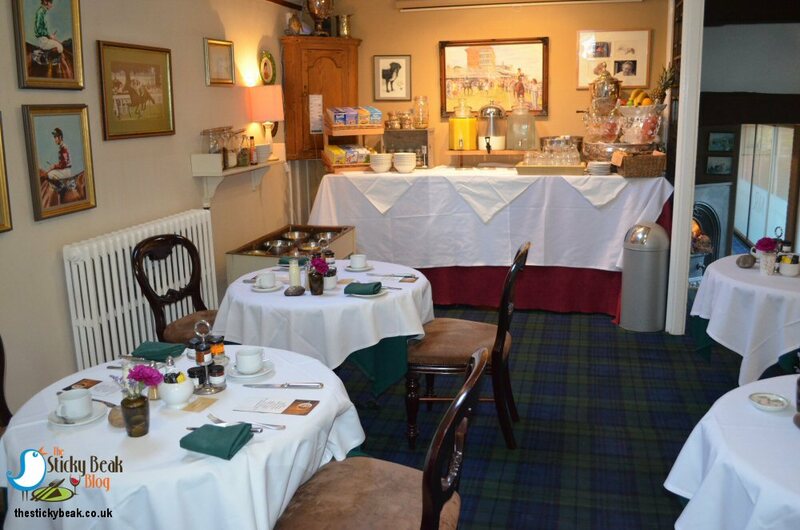 into the Breakfast room, replete with blue and green tartan carpet. I’m not clued up on Tartans, so not sure if it was Blackwatch Tartan or not. The tables were laid with green cloths, overlaid with white cloths, and had gleaming cutlery and crockery on them. A lovely chap, Andy I think was his name, came and asked whether we wanted tea or coffee and went off to get those for us. In the meantime, His Nibs went to the breakfast bar and got us some orange juice, managing to avoid the temptations of the pastries, croissants, fresh fruit, cereals, and granola. We also ordered some toast to tuck into and I was surprised the The Man didn’t order some Hot Porridge with runny Honey and brown sugar as well. I mentioned the awesome, long-remembered Kedgeree at the start of the blog, and this was the zenith of the weekend for me –the point at which I got to order this treasure! Julian (Oxo’s on the Mounts’ manager) had intimated that he was going to put a request in for this to be made for me, and lo-and-behold! it was the Breakfast Special for the day that morning. Thank you Julian, you’re a legend. The Kedgeree was magnificent, every bit as good as I’d been imagining it to be. The spiced rice with its tell-tale Turmeric tinge was cooked perfectly (just the merest hint of texture left to it) and had soft onion, peas and sweetcorn within it grains. A to-the-second, perfectly soft boiled egg had been halved and each piece flanked the mound of Kedgeree proudly. I lost count of how many chunks of smoked Haddock were in my breakfast dish, but writing this post-York I can tell you that I needed nothing else to eat until afternoon tea at 3pm! His Nibs is partial to a good English fry-up for breakfast as you know, and the Mount Royale Mixed Grill at breakfast scores a bull’s-eye in the taste stakes. This morsel consists of Bacon, Sausage, Black Pudding, Tomato, Baked Beans, Fried Bread, Mushrooms, Hash Brown, and a choice of Fried, Poached, or Scrambled Eggs (The Man had Fried). 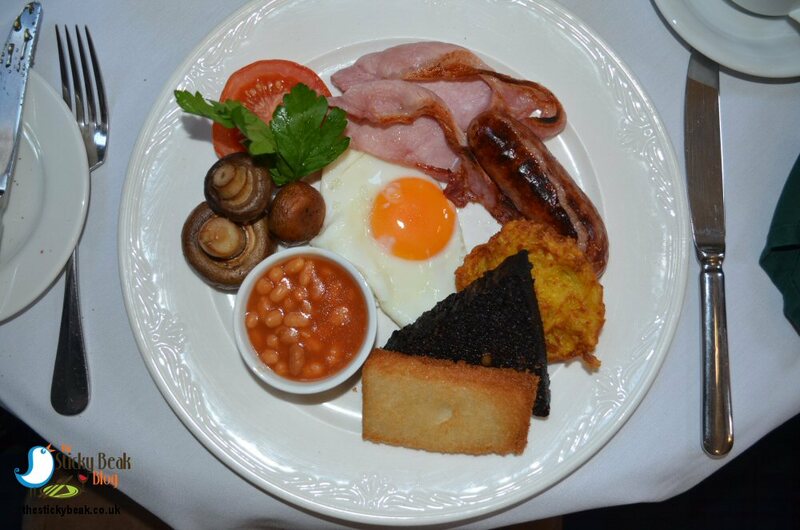 The Mount Royale Hotel, York, uses only free range eggs and the Black Pudding is Doreen’s Black Pudding from Sykes House Farm. You can taste the happiness from free range hens’ eggs; the yolks are so rich and creamy, and the colour is dazzling. I managed to pilfer a bit of the Black Pud from His Nibs’ plate, and it was rather tasty; full bodied and satiating, not filled with bran and other nonsense. Bacon is one of the cornerstones of a hearty brekkie and the rashers at the Mount Royale Hotel are thick and hearty, ideal for quelling the most ardent of rumbling tums! Nothing can persuade The Boy Wonder that Mushrooms are a superfood, so I got the whole stash passed onto my plate – yay!! They were sweet yet earthy, and I gobbled them up greedily - I love any type of Mushroom. Sausages are another vital component of a proper fry-up and (no surprise) only the best butchers’ quality, high meat content versions are served at The Mount Royale. They soon got wolfed down, as did the homemade Hash Brown with its fab chunky texture. Actually, everything got wolfed down, and a pair of squeaky clean plates was taken back to the kitchen from our table. 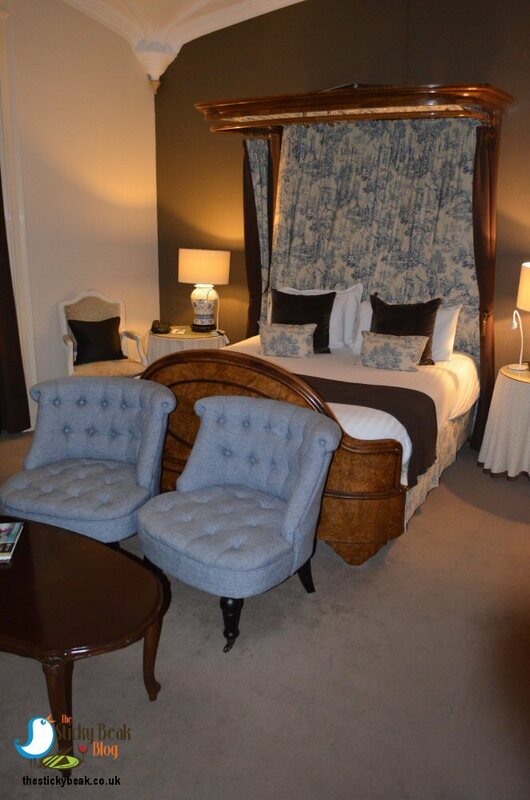 From start to finish, our experience at The Mount Royale Hotel, York, had been nothing short of wonderful. If you haven’t been before, I can thoroughly recommend it to you; and if you are a horse racing enthusiast, it’s only a short walk to the racecourse. Hot Wings most happily awarded to this divine venue and its superb team.